Menu For Hope is an annual charitable raffle whose proceeds benefit humanitarian causes around the world. The first instalment assisted victims of the South East Asian tsunami and last year monies were collected for UNICEF to help those impacted by the earthquake in the Kashmiri region of India-Pakistan. This year funds raised will go to the United Nations World Food Program. Bloggers all over the world have donated prizes--delicious, interesting, and unforgettable prizes. I'm happy to let you know that Canadian bloggers are no different--here's the link to the round-up on Caradamom Addict. If you want to see what people from other parts of the world donated, here's a link to Pim's master round-up. Special thanks to First Giving for helping with funds collecting. 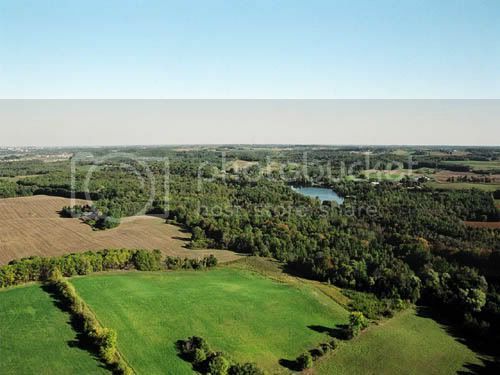 Take a day-trip to Waterloo County (approximately 100 km west of Toronto, Ontario) and be prepared for a little adventure for you and up to three guests. Work up an appetite at a guided hike through the Waterloo moraine (a beautiful natural aquifer, protected from development). My friend Kevin, an experienced hiker and someone who knows the moraine very well, will help you explore some beautiful wooded areas only a few people get to see. 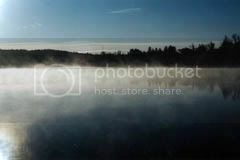 Afterwards, you'll head to his cottage on Sunfish Lake where I’ll prepare a simple supper for the six of us. If weather permits, we'll eat outside, by the lake that Canadian culinary icon, Edna Staebler, called home for about 40 years. 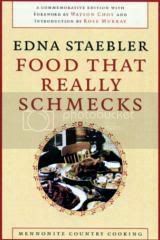 As an extra treat, the very kind people at Wilfrid Laurier Press will give the winner a copy of the just-off-the-press re-release of Edna’s first cookbook, Food That Really Schmecks, a cookbook that introduced Waterloo County Mennonite cooking to thousands of people. If this sounds like a perfect way to spend a Saturday, please mark your ballot for CA04. This outing will take place on a Saturday in late spring-summer 2007. An optional morning at the St. Jacob’s Farmer’s Market can also be included on this day-trip (click here for some pictures from my visit this autumn). Please note, the prize winner and their guests are responsible for their own transportation. Photos: top--Waterloo Moraine; bottom--Sunfish Lake. When the wonderful people at Wilfrid Laurier University Press found out about Menu for Hope III, they offered a copy of the newly re-released Food That Really Schmecks by one of my favourite people, Edna Staebler. Originally published in 1968, Edna’s book became an instant favourite, bringing the world of Mennonite cooking to homes all over North America. Her narrative is chatty, humorous and no-nonsense and you’ll feel as if you’re reading a letter from a dear friend. This edition, published to celebrate her 100th birthday, includes forwards by two of her dear friends, Canadian cookbook icon Rose Murray and famed author Wayson Choy. As an aside, I have a copy of this and I do cook from it. The recipes work and Edna's wonderful voice comes through--as do the voices of her Mennonite friends, from whom she received a number of recipes. I think this is a great cookbook. Anyone interested in food, good writing and/or Canadiana would absolutely love it. If this sounds like you or someone you know, please mark your ballot for CA15 - Food That Really Schmecks. Okay, so you've seen prizes that you want, either here or on one of the other round-ups. How do you put your name in for one or more of these fabulous offerings? 1. Go to the donation page at (http://www.firstgiving.com/menuforhopeIII) to make a contribution. 3. Some companies will match personal charitable donations made by staff. If your company has such a program, please remember to mark the appropriate box and fill in the information so we could claim the corporate match. 4. Please also check the box to allow us to see your email address. We need this so we can contact you in case you win a prize. If you do not do this, we will be unable to contact you. Please be assured that we will not share your email address with anyone. 5. Raffle results will be announced on 15 January on Chez Pim. Draws will be conducted electronically, thanks to Derrick at Obsession with Food for creating the computer application used to magically select names.